I have always enjoyed reading Peter Leithart. 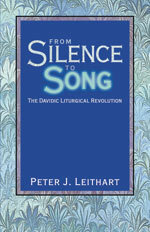 His book From Silence to Song: The Davidic Liturgical Revolution (Moscow, ID: Canon Press, 2003) is full of interesting insights. I highly recommend it. Consistent with [the Chronicler’s] overall liturgical interest, Chronicles presents David as a new Moses, who, with the great prophet, co-founded the worship of Israel. The simple fact that Chronicles devotes so much space to David’s preparations for the temple is enough to bring out parallels with Moses, since much of the revelation given to Moses concerned the tabernacle, its furnishings and its worship (Exod. 25—31, 35—40; Leviticus; Num. 3—9). Like Moses, David assigned duties to the priests and Levites. Like Moses, David received a ‘pattern’ for the house of Yahweh (Exod. 25:9, 40; 26:30; 1 Chr. 28:19). Like Moses, David ensured that the plundered riches of Yahweh’s enemies were devoted to the service of His house. When Josiah celebrated the Passover, he instructed the Levites to ‘prepare yourselves by your fathers’ households in your divisions, according to the writing of David king of Israel and according to the writing of his son Solomon’ (2 Chr. 35:4). The Levitical musicians at Josiah’s Passover ‘were also at their stations according to the command of David, Asaph, Heman, and Jeduthun the king’s seer’ (2 Chr. 35:15). If David was a new Moses, Solomon was a new Joshua, whose temple-building is implicitly compared to the conquest. David’s frequent encouragement to Solomon to ‘be strong and courageous’ (1 Chr. 22:13; 28:10, 20), echoes Moses’ instructions to Joshua, his successor (see Josh. 1:7, 9, 18; Deut 31:6-7). As Joshua was to cling to the word of the Lord delivered through Moses (Josh. 1:7-8), so Solomon was to walk in the way of the Lord’s commandments ‘as your father David walked’ (1 Kgs. 3:14; 9:4). Ibid. Also John W. Kleinig, The Lord’s Song: The Basis, Function, and Significance of Choral Music in Chronicles (JSOT Supplement #156; Sheffield: JSOT Press, 1993), 28-29. Significantly, David is given the Mosaic title ‘man of God’ in 2 Chronicles 8:14. See Wright, “The Founding Father,” 57. The reasons for David’s exhortations are not clear: What threat did Solomon face that demanded courage? In part, this exhortation highlights the fact that the temple was the conclusion and final act of the conquest. But the exhortations are most directly relevant to the original post-exilic readers of Chronicles, for, unlike Solomon, they rebuilt the temple under threat from the surrounding nations. 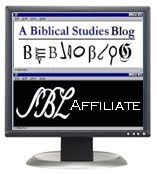 I really enjoy Leithart's blog, but I haven't read any of his books yet. This sounds like a great one to begin with.